Alexander Mogilny was born February 18, 1969 in Khabarovsk, Russia (then the Soviet Union), 30 kilometers from the Chinese border. An old saying in sports says that, no matter where you reside on this planet “if you’re good enough they will find you”. So, even though he lived on the extreme eastern edge of Siberia, 5,200 kilometers from Moscow, that adage proved to be the case with Alexander Mogilny. A product of the old Soviet hockey system, Mogilny’s talents were deemed to be of the highest caliber. Poised with the puck, Mogilny employed incredible vision to create an offense of explosive opportunity. Even though he was named the best forward at the World Junior Championships in 1988, the young star desperately wanted out of the Soviet system. With the walls of communism on the verge of collapse, he feared being trapped in his homeland for years playing for the National Red Army team. The Buffalo Sabres drafted Alexander in 1989. At that time the Russian invasion of players into the league had not yet begun. And so, being young and impatient, Mogilny made the decision to defect from his beloved mother country. He vanished from sight during the 1989 World Junior Championships in Stockholm, Sweden. When he reappeared in Buffalo, Sabres owner Seymour H. Knox III presented him with a special gift. Signifying not only the 89th pick in the draft but also the year that he came to North America, jersey number 89 became the uniform that he would wear throughout his career. Though struggling to adapt to the culture in North America and to learn the English language, Mogilny, as a rookie, managed to produce a respectable amount of offense, garnering 43 points in 65 games. His offense steadily improved over the next three years, and he succeeded in scoring 76 goals in 77 games in the 1992-93 season. The Sabres reluctantly traded Mogilny to Vancouver in 1995 where he would play for five years. He won his first and only Stanley Cup of his career playing for the New Jersey Devils in 2000. In all, Mogilny played eighteen years of professional hockey, his lengthy career ending after the 2005-06 season. 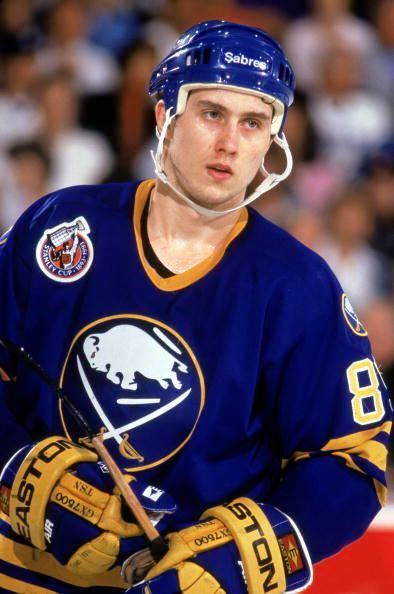 Mogilny came to Buffalo in the dark of night in 1989 at 20 years of age, played six seasons for the Sabres, a total of 990 professional games, scoring 1,032 points (444 of them as a Sabre) and was a six time NHL All Star, including three seasons with Buffalo. He was selected into the Buffalo Sabres Hall of Fame in 2011. Alexander Mogilny built for himself a truly remarkable career. Today Alexander resides back where it all started, in Khabarovsk, where he is president of the city’s hockey team in the KHL.